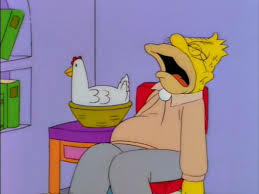 Best known as the condition that causes Grandpa Simpson to fall asleep at a moment’s notice, narcolepsy is an uncommon disorder linked to sleep patterns. This article looks at how to write believable characters with narcolepsy. Narcolepsy is a decreased ability to regulate sleep-wake cycles. The overwhelming problem with narcolepsy, and its most characteristic feature, is that people with it can feel extremely tired during the day. The most notable symptom is recurring bouts of extreme daytime sleepiness, which can result in falling asleep in unexpected and inappropriate places. Because being properly awake during the day is virtually a necessity for normal life function, narcolepsy can be a crippling condition for those afflicted. If it’s bad enough, driving a car will be impossible because of the risk of crashing (similar to epileptics). Taking public transport might not be possible either, which means that the life of the a narcoleptic character in your story might have to be a restricted one. The author should pay close heed to what’s known as the “tetrad of narcolepsy”: cataplexy, sleep paralysis, hypnagogic hallucinations and being extremely tired during the day. Cataplexy is a strange condition that involves the sudden weakening of large muscle groups. A bout of cataplexy can involve a weakening at the knees, or in the neck and head (similar to nodding off to sleep). This is one symptom that can truly wreck the life of a narcoleptic. It isn’t just that the physical debilitation is a problem, it’s that the narcolepsy sufferer learns to fear the social occasions that pose a risk of provoking one. Sleep paralysis is the experience, often terrifying, of not being able to move one’s body when awakening or falling asleep. The experience of a character undergoing sleep paralysis might be similar to one undergoing night terrors. They may feel as if they have died. Hypnagogic hallucinations are felt by narcoleptics when falling asleep. These are intense, vivid and dreamlike experiences that usually manifest as sights and sounds. These experiences can feel much like salvia divinorum experiences in that they are surreal and cause one to feel like one is present in another world. These hypnagogic experiences are sometimes disturbing enough to cause a person to get out of bed again. The excessive daytime sleepiness is probably the most striking and obvious symptom. This manifests as powerful “sleepiness attacks” that overcome the narcoleptic, no matter how much sleep they have had the previous night. These attacks may be irresistible, so much so that the narcoleptic can literally fall on the ground asleep. Narcolepsy might be more useful as a plot device than as something to afflict a character with. It could be that someone’s narcolepsy in the past led to a car accident, which then had far-reaching consequences for the protagonist of your story. Or it could be that, as a small minority of narcoleptics are “supertasters” with heightened olfactory awareness, your protagonist has a special use in forensic science or perfumery. It might even be that a character’s narcolepsy has led to them waking up and rearranging their environment during the night. This could be combined with more interesting sleep disorders, like somnambulism. Another curious point about narcolepsy is that it’s easy to confuse with an addiction to heroin or some other drugs. After all, it need not be immediately obvious to a close observer if a given person nodding off is doing so because of narcolepsy or heroin, drunkenness or something else. A character with narcolepsy might then feel that they are hard done by on account of being treated like something they’re not. Unlike most of the other psychiatric conditions in this book, narcolepsy is not caused by early childhood abuse or neglect. So a character with it is unlikely to demonstrate signs of being damaged. Possibly they are an entirely normal person by most apparent measures apart from the narcolepsy. Many stories about mental illnesses are tragedies because of the exposure to violence, neglect or abuse that caused the trauma underlying the illness. In this sense, a story about narcolepsy is probably different. The trauma might be ongoing, on account of that the coming of narcolepsy can ruin the life of an otherwise entirely normal person who had previously given no indication that they might be mentally unusual. Alternatively, the narcoleptic could be a good choice of character to place at the centre of a comedy. A problem with suddenly falling asleep all the time could make it very hard to get things done. If a band of characters had to achieve some set goal, and one of their number was a narcoleptic, that character might constantly be letting the others down by falling asleep at inopportune times. Likewise, a narcoleptic guard, surgeon or helicopter pilot might be considered inherently funny, on account of that their condition makes them exceptionally unsuited for that particular job, in a fish out of water sense. The author will have to take care to find the right balance between comic and ridiculous here.